Have we hit bottom in the Seattle condo market? My expectation is things will be flat to ever so slightly up this year from a pricing point of view and up materially from a volume point of view. So what are SCR readers planning to do with their condos before the fall? Our recent poll suggests most sellers who are planning to list their property will be doing so within the next few weeks or in the summer. If this is representative, we are most likely going to see an increase in inventory on the market. This is not unusual since inventory usually picks up in the spring and summer anyway. However, there are still a moderate number of homesellers waiting to see how the economy performs and is willing to wait till listing their units. 60% of the respondents are happy where they are and not looking at selling their condo anytime soon. Close to 2/3 of the participants feel that there are too many planned amenities for this project. I wonder if they are more concerned about higher dues that are associated with more amenities or they simply do not need them. Not surprisingly, 58% of the participants find that the location is a major selling point. It is really hard to argue about the location when it is only a couple of blocks from Pike Place Market. 65% feel that a finger print scanner at the front entrance is a neat feature but not important to them. 40% feel that the reputation of the developers is extremely important to them. With all the reports about leaky condos and delays in construction, I would have imagined more homebuyers would find that as a major consideration. Out of the various green features (green roof, solar powered common are lighting, high efficient heating and recycled builidng materials), 64% picked high efficient heating. Half of the participants are willing to pay $10,000 for air-conditioning in their unit. For full survey results, click here. Western and Blanchard- Help Design It? I've been learning about a new Belltown project summarized below. I also interviewed the developer as well as agreed to post an SCR survey to give my readers the opportunity to help design the project and to help make sure they build something that people want. Feel free to fill out the 10 question survey, it'll take you a couple of minutes and I'll post results in a couple of weeks so we can all see what people thought. Western and Blanchard, a mixed-use project will be located on the parking lot west of Continental Place Condos. (across the street from Belltown Billards). This project would be a 6 story wood framed building with approximately 116 units, 80 of them will be around 600 square feet. The top 2 levels will feature views of the water while other units may have either Space Needle or City views. Most of the units will be priced under $400,000. Interiors will feature 10' clear ceilings. Amenities would include (2) media rooms, fitness center, business center, roof top deck and perhaps part-time concierge. Projects done by the same developer, Murray Franklyn :Bellora, Pomeroy, Austin Bell, Cristalla and Madison Tower. Click below to read my interview with the developer and for a link to the survey. In a recent post, we looked at three projects completed last year and how closely the developers delivered on what they promised. Nothing beats hearing first-hand experience from homeowners who actually bought into these condos. I interviewed three buyers and summarized their responses below. Two of these homeowners were represented by me and one is an SCR reader for whom I worked on a different subsequent property. If buying a pre-sale condo as your primary residence is one of your New Year's resolutions, you may want to get some insights from some folks who preceded you in the Seattle condo market. 1.) What sold you on this condo? Primarily the location but also the price per square foot and the particular unit available. Very accurate on the concept. Did not review a model unit but floor plan was pretty close to the actual. 3.) How was the overall buying process for you? Unsatisfactory delays and poor communication by developer and developer's agent. 4.) Do you have any advice for first time new construction buyers? Review the developer's track record and also the developer's agent. Negotiate upfront remedies for delays and/or be prepared for them. How are all the new pre-sale projects impacting existing resale condos? 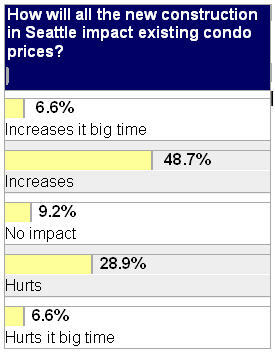 I recently posted a poll and more than half of voters felt that the new construction is only going to increase the resale units’ prices; approximately 35% of the voters felt that it will have a negative impact on the resale unit, and with 9.2% felt that it is not going to have any impact. Feel free to participate in the latest SCR poll on the right hand side of this page and vote for the most attractive architecture of all the Belltown/ downtown condos.